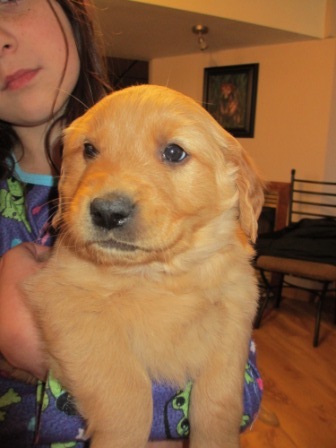 But more importantly, my husband is flying through Denver, Colorado, to pick up our new puppy, Denver. Look at that face! He just makes you want to hug him, doesn’t he? After getting over my episode of sheer terror at the thought of raising a new puppy again, I’m really quite excited. I sort of feel like a kid on Christmas Eve. I can’t wait to meet the little guy. I am sure he has no idea what is about to happen to him. He will leave his familiar place….his mom and his siblings. (Now I feel like I want to cry.) He will be transferred to the hands of a man he hasn’t met and go on a long airplane ride in a soft crate under my husband’s seat. It may be a bit traumatic. It’s sort of like a “new birth”. He will likely wonder what new world he is entering into -and he must entrust himself to his new owner. However, what he doesn’t know is what is waiting for him on the “other side”. I’ve been “preparing a place for him”. He’s got a “Cadillac crate”, new toys, a new collar, puppy treats, some big brothers, a family of adults and children who can’t wait to shower their love on him, and a promise of care, training, and lots and lots of love. It’s going to be a good life. We can’t wait for him to get here. I thought of this “transition to a new place” when my grandchildren were born. There they were, in a safe, warm and snuggly womb. However, little did they know that on the “other side” were parents and grandparents, and aunts and uncles who already loved them. And there were hugs, kisses, and even (as I had with three of my grandchildren tonight) pizza, brownies and ice cream awaiting their futures as well. That’s got to be way tastier than anything the umbilical cord offers. I can’t help but wonder if this is something of what God feels as He awaits His children’s arrival – from their “new birth” all the way until heaven. He must shake his head at how attached we can get to the world, scared to let go, and sometimes have fear of trusting Him…when we have no idea that “amazing awaits” – on the other side. This entry was posted in Uncategorized and tagged devotional thought, fear, heaven, inspiration, puppies, spiritual lesson by jeanieshaw. Bookmark the permalink. That puppy is so precious, I love the name Denver even though the Pats are playing tonight against Denver. I’m so excited for the whole family. I can wait to meet him. I love puppies so much. Can’t wait for you to meet him. Come on over when you get back from Honduras. Still wanting to do a belated birthday lunch. Love you. Thanks Maria. So glad you can “share” him. Love you. Can’t wait to meet Denver!! Wyndham was excited about going to get him!! I wish I could see Denver as a puppy–they are so extra cute at that stage! I’m excited with you! Thanks for sharing in our excitement…and mostly for sharing friendship…Love you so much. He is really quite adorable. Hope you can meet him. I have a feeling he will be the subject of a few blogs. He is a bit Marley-ish :-). Love you! Thank you Jeanie for training us to look at life with spiritual eyes. I love to read your Morning Cup and reflect on the insights you share. I, too, would love to meet your new puppy…maybe John and i could come over to spend time with you all? Thanks so much Lori. You are a wonderful encourager. Look forward to your meeting him on Monday!